Porches at Arbor Creek is a community in Edmond, Oklahoma, near Oklahoma City. The clubhouse contains a fitness room, yoga studio, and much more. Homebuilder McCaleb Homes began construction on this community in 2013. Each townhome includes many well-appointed touches like large covered porches and formal dining rooms. The center of activity at Porches at Arbor Creek is the clubhouse. Residents meet in the multi-purpose rooms after preparing light snacks for parties and events in the catering kitchen. To keep in shape, a fitness room along with a yoga and aerobics studio are also provided. Outside, residents spend time with friends and neighbors on the patio in the evenings. McCaleb Homes broke ground on Porches at Arbor Creek in 2013. Each energy-efficient homes include an attached garage and a large covered porch. All homes come with open floor plans and designer features throughout. Homeowners in Porches at Arbor Creek will enjoy living a maintenance-free lifestyle. A homeowners’ association will ensure basic common area maintenance, leaving residents to enjoy all the amenities the community and surrounding area offers without having to worry about doing yard work. Holiday parties, social events, yoga, and aerobics will be just some of the exciting activities to participate in around the community. Located in Edmond, Oklahoma, Porches at Arbor Creek will be near many shopping, dining, and entertainment opportunities, as well as several day-to-day conveniences. Only five minutes away will be a Walmart Supercenter, Sam’s Club, Target, and much more. Being located just 20 minutes away from Oklahoma City, residents will be able to enjoy big-city entertainment. Chesapeake Arena, Civic Center Music Hall, and the Chickasaw Bricktown Ballpark are just a handful of the places one can visit for culture and entertainment in the Oklahoma City Area. 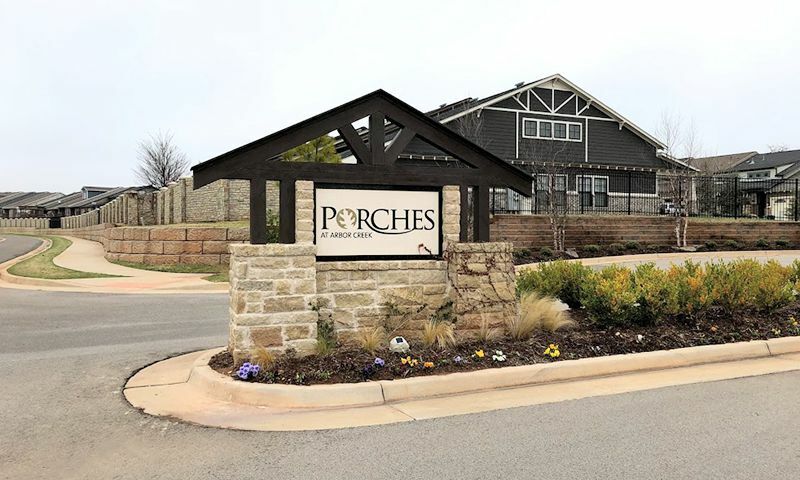 No matter what you love to do, you’ll be able to find exciting and new places to eat, shop, and have fun in Central Oklahoma at Porches at Arbor Creek. There are plenty of activities available in Porches at Arbor Creek. Here is a sample of some of the clubs, activities and classes offered here. McCaleb Homes broke ground on Porches at Arbor Creek in 2013. Each energy-efficient home is planned to include an attached garage and a large covered porch. 55places.com is not affiliated with the developer(s) or homeowners association of Porches at Arbor Creek. The information you submit is distributed to a 55places.com Partner Agent, who is a licensed real estate agent. The information regarding Porches at Arbor Creek has not been verified or approved by the developer or homeowners association. Please verify all information prior to purchasing. 55places.com is not responsible for any errors regarding the information displayed on this website.